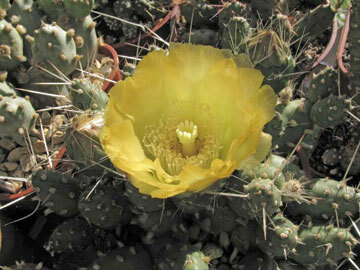 The large prickly pear cacti (Opuntias) have many flat pads which are joined together. They grow so quickly that they can be used as a living fence. They are also sometimes grown for tortoise food. Tortoises must have very tough mouths to be able to enjoy a meal of cactus! All Opuntias have an additional defence – small hooked spines (called glochids) which come off when the cactus is touched. If you get these in your fingers try sticky tape to remove them. Opuntias have beautiful flowers. They might be yellow, orange or red. Not all Opuntias have large pads, some are much smaller with round stems. There is more than one plant in this picture – how many can you see? Some of these small Opuntias live in Patagonia, in the most southerly part of South America. This is the furthest south any cactus can grow. 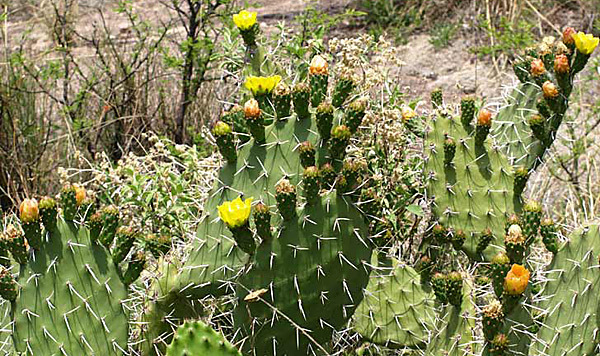 Some Opuntias have large tap-roots – in the wild the plant can hardly be seen, except when it flowers, as most of it is underground. This plant is called Pterocactus tuberosa. The stems are shown on the left and the enormous root on the right.